"Cervical radiculopathy is a disease process marked by nerve compression from herniated disk material or arthritic bone spurs. This impingement typically produces neck and radiating arm pain or numbness, sensory deficits, or motor dysfunction in the neck and upper extremities." Cervical radiculopathy occurs with pathologies that causes symptoms on the nerve roots. Those can be compression, irritation, traction, and a lesion on the nerve root caused by either a herniated disc, foraminal narrowing or degenerative spondylitic change (Osteoarthritic changed or degeneration) leading to stenosis of the intervertebral foramen . Most of the time cervical radiculopathy appears unilaterally, however it is possible for bilateral symptoms to be present if severe bony spurs are present at one level, impinging/irritating the nerve root on both sides. If peripheral radiation of pain, weakness or pins and needle are present, the location of the pain will follow back to the concerned affected nerve root. The human body has 8 cervical nerve roots, for 7 cervical vertebrae and this may seem confusing at first. However a nerve root comes out of the spinal column between C7 and T1, hence C8 as T1 already exists . Tanaka N. et al used a surgical microscope to do an anatomic study of the of the cervical intervertebral foramina, nerve roots and intradural rootlets. The intervertrebral foramina were shaped like a funnel with the entrance zone being the most narrow part. This was considered the place where the compression of the nerve roots in the intervertebral foramina occurs. Compression of the roots at the anterior side was ascribed to protruding discs and osteophytes of the uncovertebral region. Compression on the posterior side was caused by the superior articular process, the ligamentum flavum and the periradicular fibrous tissues. Nerve roots and the local vessels lack a perineurium and have a poorly developed epineurium, making them vulnerable to mechanical injury when compared to the periphery. The blood supply is also less secured and vulnerable to ischemic damage. These anatomical difference to peripheral nerves may explain why low pressures on the nerve root elicit large changes and signs and symptoms. The nerve roots are vulnerable to pressure damage which is why small impingements can cause signs and symptoms. At 5-10mmHg (0.1psi) capilliary stasis and ischemia has been observed with partial blockage of axonal transport. At 50mmhg tissue permeability increases with an influx of oedema, higher to 75mmhg, there is nerve conduction failure if sustained for 2 hours. At 70+mmhg neural ischemia is complete and conduction is not possible. It is rare to get pressures that high but 5-10mmhg is a large small amount of pressure and signs and symptoms occur. These pressures can occur with a less severe clinical picture in unique circumstances, if the pressure is acute then symptoms are severe however if chronic the nervous tissue is given time to adapt and evolve to the surrounding structure and symptoms are less severe. Cervical radiculopathy is a dysfunction of a nerve root in the cervical spine, is a broad disorder with several mechanisms of pathology and it can affect people of any age, with peak prominence between the ages of 40-50 . Reported prevalence is of 83 people per 100,000 people . Annual incidence has been reported to be 107,3 per 100.000 for men and 63,5 per 100.000 for women. Typical symptoms of cervical radiculopathy are: irradiating arm pain corresponding to a dermatomal pattern, neck pain, parasthesia, muscle weakness in a myotomal pattern, reflex impairment/loss, headaches, scapular pain, sensory and motor dysfunction in upper extremities and neck. Where a nerve root is compressed it can cause a combination of factors: inflammatory mediators, changes in vascular response and intraneural oedema which causes radicular pain. Absence of radiating pain does not exclude nerve root compression. The same appears with sensory and motor dysfunction that might be present without significant pain . Symptoms are generally amplified with side flexion towards the side of pain and when an extension or rotation of the neck takes place because these movements reduce the space available for the nerve root to exit the foramen causing impingement . This often causes the patient to present with a stiff neck and a decrease in cervical spine ROM as movement may activate their symptoms. This may result in secondary musculoskeletal problems which can manifest as a decrease in muscle length of the cervical spine musculature (upper fibres of trapezius, scaleni, levator scapulae), weakness, joint stiffness, capsule tightness and postural defects which can go on to affect movement mechanisms of the rest of the body. Differentiating from cervical radiculopathy is derived from a combination of a patient's history, physical examination and radiological findings. Pathologies which mimic the signs an symptoms of radiculopathy. The most common diagnostic methods used to assess the presence of possible compression are radiographs, MRI and electrophysiologic studies (EMG + Nerve Conduction Studies) to examine the nerve root and nerve conduction velocity . Root compression seen on an MRI may confirm cervical radiculopathy, but to detect foraminal stenosis, which causes a bony compression on the nerve, spiral CT is described as the best way to detect this. There still is no consensus on whether conventional needle myography (EMG) has a strong diagnostic value for cervical radiculopathy. Several unblinded studies have reported sensitivities ranging from 30-95%. A subjective history and mechanism of Injury can be integral to an accurate diagnosis and the cause of radiating arm pain. More frequently acute radiating arm pain is caused by a disk herniation, while chronic bilateral axial neck and radiating arm pain is usually caused by cervical spondylosis . Joshua A. et al concluded that the PSFS had superior reliability, construct validity, and responsiveness in patients with cervical radiculopathy compared to the NDI, but also stated that further research was needed. The Neck Pain and Disability Scale factor scores are useful in identifying treatment effects on the specific dimensions involved in the pain experience. Provocative tests are performed to provoke or worsen the symptoms in the affected arm and are indicative of cervical radiculopathy. involved side cervical rotation range of motion less than 60 degrees. When all 4 of these clinical features are present, the post test probability of cervical radiculopathy is 90%, Where only 3 of the 4 tests are positive the probability decreases to 65% . A further combination of tests with good reliability are the combination of Spurlings Test, Neck Distraction, Valsalva and Upper Limb Tension Tests 1, 2a and 2b. Tong HC et al . performed the Spurling test before imaging was completed. The test had a sensitivity of 30% and a specificity of 93%. They concluded that the Spurling test is not sensitive, but it is very specific for cervical radiculopathy. It is therefore not useful as a screening test but it can well be used to confirm a cervical radiculopathy. 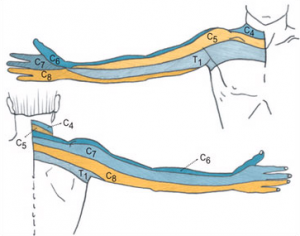 A study conducted by Gumina et al found Arm Squeeze test useful to distinguish between cervical nerve root compression and shoulder disease. The test has 96% for both sensitivity and specificity, inter-observer value of 0.81 and intra-observer value of 0.87. However, the test utilizes subjective measures and needs to be validated. 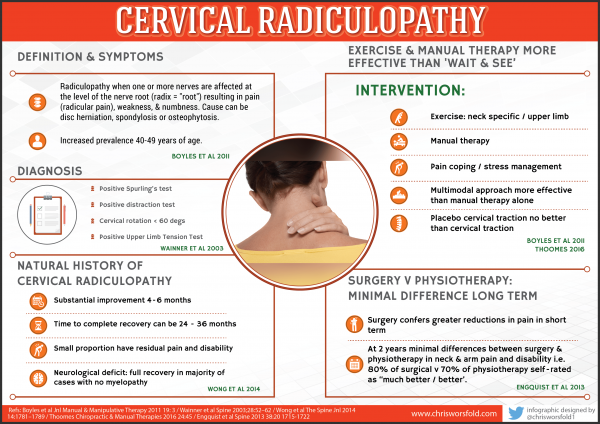 There are several intervention strategies for managing cervical radiculopathy, with physical therapy and surgical interventions being the most common. The long term benefits of surgical interventions are questionable however with 25% of patients continuing to experience pain and disability at 12 month follow-ups . There is a significant amount of evidence to support the use of physical therapy interventions , and the benefit of physical therapy and manual techniques in general for patients with neck pain with or without radicular symptoms. A positive response to a selective nerve root block (SNRB). Positive MRI or myelogram with computed tomography (CT) scan. At least 6 weeks of conservative care such as physical therapy, epidural injections, NSAID’s, pain killers. In case of clear motor deficit, 6 weeks of conservative care are not required. All of the criteria previously described for a single level surgery, not including SNRB, are present at the primary level. The adjacent level has radicular pain correlating with at least moderate foraminal stenosis or lateral recess herniation or EMG changes, motor deficits or reflex changes correlated to adjacent level. Engquist M et al. found that surgery with physiotherapy resulted in a more rapid improvement during the first postoperative year, with significantly greater improvement in neck pain and the patient's global assessment than physiotherapy alone. The differences between the groups decreased after 2 years. They suggested that structured physiotherapy should be tried before surgery is chosen. Persson et al. concluded that there were no long term (1 year) differences between surgery and physical therapy in strength, pain and sensation. Several other studies demonstrated that physical and social functioning and pain significantly improved after surgery, although these improvements remained relatively short termed (max 1 year) and diminished after a longer period (1 to 4 years). Short duration of pain, low health quality, high levels of anxiety due to neck/arm pain, low self-efficacy, and a high level of distress before treatment were associated with poor outcomes from surgery. Although a definitive treatment progression for treating cervical radiculopathy has not been developed, a general consensus exists within the literature that using manual therapy techniques in conjunction with therapeutic exercise is effective in regard to increasing function, as well as active range of movement (AROM), focusing on decreasing levels of pain and disability will most likely be the main focus of the patient (LoE 1A). Recent high level research confirms the positive outcomes of exercise therapy (LoE 1A). If the patient has had long-term pain, an element of pain sensitisation may have developed and chronic pain behaves differently to acute pain. Therefore education about pain and reconceptualisation may be necessary. Education is key to getting the patient on side and to work co-operatively with physiotherapy. If a patient understands the condition and the reason for the neck and arm pain then they are more likely to be compliant with any rehabilitation plan. Furthermore, cervical spine manipulation carries a risk of complications like vertebral dissection and spinal cord compression because of massive disc herniation. Therefore, this intervention should be discouraged in cervical radiculopathy, especially if imaging of the spine has not yet been performed. (LoE 2A) Aware of any potential risk factors such as arterial insufficiency, Hypertension, Craniovertbral ligament insufficiency and upper motor neurone disorders is also essential(LoE 5). Boyles et al (2011) (LoE 1A) however found that manual therapy consisting of thrust mobilisations of the cervical or thoracic spine and cervical non-thrust mobilisations (PA glides/Lateral Glides in ULTT1 position/Rotations/Retractions) was shown to be effective at reducing pain levels, improving function and increasing joint ROM. When combined with exercise therapy it was more effective than the control group of manual therapy or exercise therapy however both control groups were effective at reducing signs and symptoms (LoE 2B). Persson et al (LoE 2B)highlighted that there was no significant difference between outcome measures of patients who had had surgery, physiotherapy or cervical collar explaining that physiotherapy is at least as effective as surgery. Cleland et al (LoE 4) utilised muscle energy techniques (MET) in 28 patients, 46% recieving positive outcomes. However details of the techniques used were insufficient and a variety of techniques were used as it was down to the practitioner to decide which technique would be used. 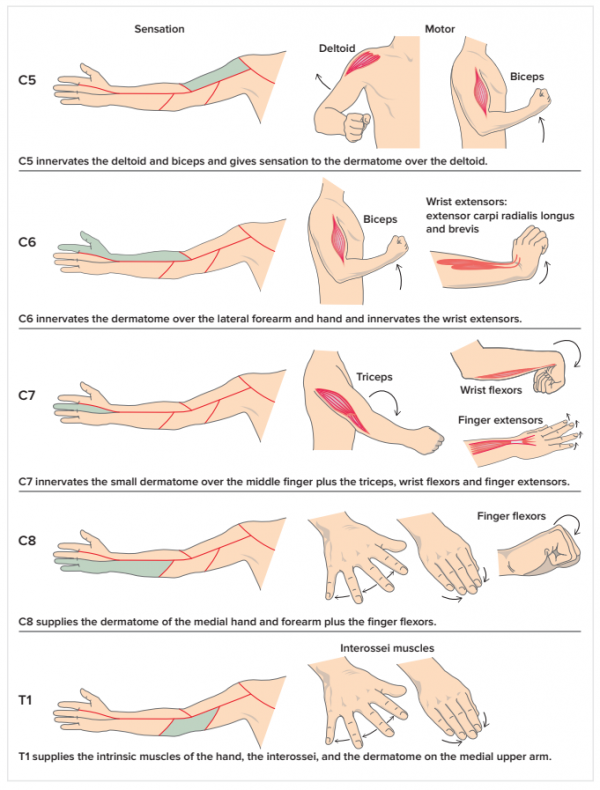 Ragonese (2009)(LoE 2B) performed the neurodynamics sliding and tensioning techniques, outlined by Butler(LoE 5), whilst having the patient in an upper limb tension positions described by Magee (LoE 5) conducted in a slow and oscillatory manner. With improvement in symptoms, the technique was progressed to a ‘tension’ technique, also described by Butler. Again, positive outcomes were observed in regards to pain and function, although treatment duration was not recorded. Patient should be instructed to remain as active as possible and perform exercises daily on the days between therapy sessions. Written exercise instructions should therefore be available. We suggest a 2 components program, as suggested by Fritz JM et al. 2 components: scapula strengthening and cervical strengthening. Cervical strengthening exercises should include supine craniocervical flexion to elicit contraction of the deep neck flexor muscles without contraction of superficial neck muscles (LoE 1B). Feedback using an air-filled pressure sensor or tactile cues can be useful. Patient should perform three sets of 10 contractions of 10 seconds with proper muscle activation. Craniocervical flexion contractions were also performed with the patient seated, with the goal of 30 repetitions of 10-second contractions. Scapular retraction against resistance using elastic bands or pulleys can be added. Scapular-strengthening exercises included prone horizontal abduction, sidelying forward flexion, prone extension of each shoulder, as well as prone push-ups with emphasis on shoulder protraction. The goal was 3 sets of 10 repetitions, with resistance added as tolerated. Cervical radiculopathy is defined as a disorder (compression, traction, irritation, herniated disk) affecting a spinal nerve root in the cervical Spine. Cervical radiculopathy typically produces neck and radiating arm pain, numbness, sensory deficits, or motor dysfunction in the neck and upper extremities. It is important to have knowledge of the cervical anatomy, because it is the key to effective physiotherapy practice and treatment. Because there are other pathologies that have the same signs and symptoms of radiculopathy, it’s recommended to do a good examination. You can use imaging studies (MRI) or electro physiologic studies(EMG + Nerve Conduction Studies) . Better, is to use these 4 clinical tests: Spurlings Test, Upper limb tension-1 Distraction test and Cervical Flexion Rotation Test. When all 4 of these clinical test are positive, the post-test probability of cervical radiculopathy is 90%. The main focus for physical therapy or medical management of cervical radiculopathy, is decreasing the pain and disability. Once the treatment is started, it’s important to choose the right tool to evaluate your patient. The Neck disability index is a good option. ↑ 1.0 1.1 Eubanks J. Cervical Radiculopathy: Nonoperative Management of Neck Pain and Radicular Symptoms. Am Fam Physician. 2010 Jan 1;81(1):33-40. ↑ Radhakrishnan K, Litchy WJ, O'Fallon M, et al. Epidemiology of cervical radiculopathy: A population-based study from Rochester, Minnesota, 1976 through 1990. Brain 1994; 117:325-335. ↑ 9.0 9.1 9.2 9.3 Barrett I. et al. Cervical Radiculopathy Epidemiology, Etiology, Diagnosis, and Treatment. Journal of Spinal Disorders &Techniques. April 2015; 28:5. ↑ Ellenberg M, Honet J, Treanor W. Cervical Radiculopathy. Arch Phys Med Rehabil. 1994; 75:342-352. ↑ Partanen J, Partanen K, Oikarinen H, et al. Preoperative electroneuromyography and myelography in cervical root compression. Electromyogr Clin Neurophysiol. 1991; 31:21-26. ↑ 23.0 23.1 Wainner RS, Fritz JM, Irrgang JJ, et al. Reliability and diagnostic accuracy of the clinical examination and patient self-report measures for cervical radiculopathy. Spine. 2003;28(1):52-62. ↑ C: Wainner et al. Reliability and diagnostic accuracy of the clinical examination and patient self-report measures for cervical radiculopathy. Spine 2003 Jan 1. 28(1):52-62. ↑ Heckmann J, Lang J, Zobelein I, et al. 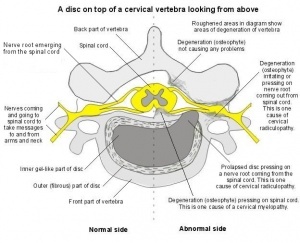 Herniated cervical intervertebral discs with radiculopathy: an outcome study of conservatively or surgically treated patients. J Spinal Disord. 1999;12:396-401. ↑ 31.0 31.1 31.2 Cheng CH, Tsai LC, Chung HC, Hsu WL, Wang SF, Wang JL, Lai DM, Chien A. Exercise training for non-operative and post-operative patient with cervical radiculopathy: a literature review. 2015 Sep. J Phys Ther Sci. 27(9): 3011-8. ↑ 32.0 32.1 Leveque JC. Diagnosis and treatment of Cervical Radiculopathy and Myelopathy. 2015. Physical medicine and rehabilitation clinics of North America 26(3): 491-511. ↑ 34.0 34.1 Engquist M et al., Surgery Versus Nonsurgical Treatment of Cervical Radiculopathy: A Prospective, Randomized Study Comparing Surgery Plus Physiotherapy With Physiotherapy Alone With a 2-Year Follow-up. 15 september 2013. Spine, 38(20): 1715–1722. ↑ 35.0 35.1 Persson LC1, Moritz U, Brandt L, Carlsson CA. Cervical radiculopathy: pain, muscle weakness and sensory loss in patients with cervical radiculopathy treated with surgery, physiotherapy or cervical collar. A prospective, controlled study. Eur Spine J. 1997;6(4):256-66. ↑ Kim H, Lee SH, Kim MH. Multislice CT fluoroscopy-assisted cervical transforaminal injection of steroids: technical note. J Spinal Disord Tech 2007;20:456–61. ↑ Lee SH et al. Clinical Outcomes of Cervical Radiculopathy Following Epidural Steroid Injection: A Prospective Study With Follow-up for More Than 2 Years. 20 May 2012. Spine 37(12): 1041-1047. ↑ Boyles, Robert; Toy, Patrick; Mellon, James; Hayes, Margaret; Hammer, Bradley.Effectiveness of manual physical therapy in the treatment of cervical radiculopathy: a systematic review Journal of Manual and Manipulative Therapy 19 (2011) 135-142. ↑ 42.0 42.1 Langevin P, Desmeules F, Lamothe M, Robitaille S, Roy JS. Comparison of 2 manual therapy and exercise protocols for cervical radiculopathy: a randomized clinical trial evaluating short-term effects. 2015 Jan. J Orthop Sports Phys Ther 45(1):4-17. ↑ Cross KM, Kuenze C, Grindstaff TL, Hertel J.Thoracic spine thrust manipulation improves pain, range of motion, and self-reported function in patients with mechanical neck pain: a systematic review.J Orthop Sports Phys Ther. 2011 Sep;41(9):633-42. ↑ Fritz JM, Thackeray A, Brennan GP, Childs JD.Exercise only, exercise with mechanical traction, or exercise with over-door traction for patients with cervical radiculopathy, with or without consideration of status on a previously described subgrouping rule: a randomized clinical trial. J Orthop Sports Phys Ther. 2014 Feb;44(2):45-57. ↑ Jellad A, Ben Salah Z, Boudokhane S, Migaou H, Bahri I, Rejeb N.The value of intermittent cervical traction in recent cervical radiculopathy.Ann Phys Rehabil Med. 2009 Nov;52(9):638-52. ↑ 51.0 51.1 Ragonese J. A randomized trial comparing manual physical therapy to therapeutic exercises, to a combination of therapies,for the treatment of cervical radiculopathy. Orthop Prac 2009;21(3):71–7. ↑ 52.0 52.1 Cleland JA, Whitman JM, Fritz JM, Palmer JA. Manual physical therapy, cervical traction, and strengthening exercises in patients with cervical radiculopathy: a case series. J Ortho Sports Phys Ther 2005;35:802–11. ↑ Franke H, Fryer G, Ostelo RW, Kamper SJ .Muscle energy technique for non-specific low-back pain. Cochrane Database Syst Rev. 2015 Feb 27;2:CD009852. LoE: 1A. ↑ Magee DJ. Orthopedic physical assessment. 5th ed. St. Louis,MO: Saunders Elsevier; 2008. ↑ Cleland JA, Fritz JM, Whitman JM, et al. Predictors of short-term outcomes in people with a clinical diagnosis of cervical radiculopathy. Phys Ther. 2007;87(12):1619-1632.